The responsibilities of Graduate Program Faculty can be found in the Rationale section of the Policies and Procedures for Appointment and Reappointment to the Graduate Program Faculty. 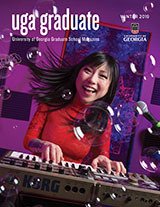 A member of the Graduate Program Faculty of the University of Georgia may have their Graduate Program Faculty status removed if they fail to meet any or all of the expectations outlined above, as assessed during the periodic review process. Procedures for the periodic review of Graduate Program Faculty are in Procedures for Appointment and Reappointment of the Graduate Program Faculty section of the policy document referred to above. It is also possible for a member of the Graduate Program Faculty to have their Graduate Program Faculty status revoked by the dean of their college or school, the Dean of the Graduate School, the Provost, or the President outside the periodic review process. Revocation may occur for egregious acts or when a faculty member fails to fulfill the responsibilities of a member of the Graduate Program Faculty to teach graduate student(s) effectively, in a civil, professionally appropriate manner, to do scholarly research and creative work of high quality or remain active in the practice of the profession, and to direct the research/professional development of graduate student(s) so that they progress toward graduation in a timely manner appropriate to the field. Failure to teach graduate students effectively and/or to direct the research and professional development of graduate student(s) also includes, but is not limited to, abuse of power, intimidation and harassment, violation of work place violence policies and other acts covered by the UGA Non Discrimination and Anti-Harassment Policy. When a graduate student or faculty member has a complaint about the performance or behavior of a faculty member directly related to their responsibilities as a Graduate Program Faculty member, the first course of action should be to try to resolve the complaint directly with the faculty member. If the student/faculty member is unable to resolve the complaint with the Graduate Program Faculty member, then an oral or written complaint should be delivered to the unit head and/or the departmental graduate coordinator. The unit head and/or graduate coordinator must investigate the complaint (unless they have a conflict of interest) and work with the student/faculty member making the complaint (complainant) and the Graduate Program Faculty member. The unit head and/or graduate coordinator must provide a written summary to the complainant and to the Graduate Program Faculty member against whom the complaint was made of the outcome of their investigation of the complaint and of the recommendations made to resolve the issue. A copy of this letter will be placed in the personnel file of the Graduate Program Faculty member. If the graduate coordinator or the unit head are unable to resolve the issue, or the Graduate Program Faculty member or complainant is not satisfied with the resolution, then a committee consisting of three Graduate Program Faculty members (at least one of whom must be from outside the unit) must be appointed to further investigate the complaint. The appointed committee must convene to review the complaint and to meet with all affected parties and provide a written assessment to the unit head and/or graduate coordinator with recommendations for necessary action. A copy of this letter will also be provided to the complainant and the Graduate Program Faculty member against whom the complaint has been made, and a copy will be placed in the personnel file of the Graduate Program Faculty member. In response to the recommendation from the committee, the unit head and/or graduate coordinator may initiate procedures for re-evaluation of the Graduate Program Faculty status of the faculty member against whom the complaint has been made. Graduate Program Faculty in the academic unit will review and vote on a recommendation to revoke the Graduate Program Faculty status of the faculty member and shall follow Appointment and Reappointment procedures for recommendation to the Graduate Program Faculty including consideration of all documentation associated with the recommendation. If the Graduate Program Faculty vote to revoke graduate faculty status, a letter from the unit head and/or graduate coordinator and all documentation associated with the recommendation will be forwarded to the dean of the college/school. The dean of the college/school will forward this information together with a letter of recommendation to the dean of the Graduate School. The faculty member has the right to make an appeal against the decision to the dean of the Graduate School who will forward the information or review to the Appeals Committee of the Graduate Council. The committee will provide a recommendation to the dean, who will render a decision and notify all parties as to the resolution of the matter. If the dean of Graduate School upholds the decision of the unit’s Graduate Program Faculty, the faculty member has the right to make an appeal against the decision to the Provost. This appeal must be made in writing within 14 days of the dean of the Graduate School providing notification of the removal of Graduate Program Faculty status. The Provost is the final arbiter of the decision to revoke Graduate Program Faculty status. If the decision results in revocation of Graduate Program Faculty status, then the dean of the school or college will work with the academic unit to develop a plan of action that will allow the faculty member to reapply for Graduate Program Faculty status. All investigations into complaints against Graduate Program Faculty must be dealt with expeditiously. Normally, there should be no more than 30 days between the presentation of the complaint and resolution of a complaint or, if necessary, a vote by the Graduate Program Faculty in the academic unit on the Graduate Program Faculty status of the faculty member against whom the complaint was made. If efforts are ongoing to resolve the complaint, the unit head and/or graduate coordinator may extend the time for formal review of the complaint. Both the faculty member and the complainant have the right to seek the advice of an attorney, but attorneys are not authorized to participate in the dispute resolution process. Students and faculty members who, in good faith, report what they believe to be a valid complaint, or who cooperate in any investigation, will not be subjected to retaliation. Any student or faculty member who believes he or she has been the victim of retaliation for making a complaint or cooperating in an investigation should immediately contact the unit head and/or graduate coordinator. Any person found to have retaliated against a person who has cooperated in an investigation will be in violation of this policy and will be subject to disciplinary action.